The camps listed and reviewed here reflect only our personal opinion, based on our experience either because we stayed in the camp, or because we visited and talk to the host or hostess. I use no rating system. Our preferences go to camps which offer privacy, a natural setting, clean facilities, but also TLC. That they care, not only for our money, but for ..... Higher prices, no problem, but increasingly we have found, free or near-free, national and.... camps to be better kept, better cared for than $20 and over, private camps. Public facilities need better attendance and are doing something about it. Since we travel without children and have work to do, we avoid "family camps" and "resorts" which put emphasis on kids' activities. I interviewed owners and/or managers whenever I could. Related articles and fellow RVers stories are mentioned in hypertext (i.e. underlined text) which link to the article itself.Prices listed here are current for 198. Some camps do not figure in other guides. 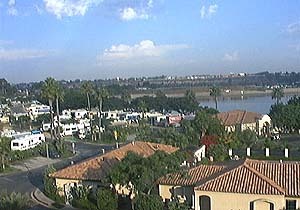 - Trailer Life's "Campground/RV Park and Service Directory"
- Woodall's " North American Campground Directory"
- American Automobile Association (Or AAA)'s "CampBook"
The Newport Dunes first opened in 1958 and was later aquired by San Diego hotelier, Bill Evans. Today, the Evans' 28-year-old daughter, Anne Evans Quinn, still overseas the resort's operations and has created the daily calendar of activities. The resort Village Center includes a swimming pool, spa, convinience store, recreation rooms, laundry facilities, as well as conference and meeting rooms. Here it's Wheels in the sand - as close to the ocean as you'll ever be. From your bedroom or tent, the view is of a gloriously wide beach of fine white sand and the Pacific beyond. The ocean breeze and the rhythm of the pounding surf, the campfires glowing in the sand, all contributes to a specially romantic evening. And makes it easy to overlooked many things. - No hook-ups. Even though sites are separated by trees and shrubs, the mix of RV's, tents and families camping right on the sand, next to their vans or 4 by 4's, makes the camp noisy and difficult to keep clean. Not too many places for large rigs. The best spaces we found for our 37-footer are numbers 70 to 75. We ended up paying $30 (23 + $1 for the dog + $6 for a "second vehicle") because we didn't "tow" our car in. It followed the rig. It should have been attached . Regular prices are $17 to 23. These are not retired people, but an active, working group. The atmosphere is lively, congenial, at times even rowdy. Workers returning to camp is cause for nightly celebrations, fishermen arrive early, stay late. Motor boats and Jet-skis roar, crisscrossing the lake like huge, colored bumble bees. This is also a favorite meeting place for groups. The day we parked at Lake Elsinore, the Good Sam Club had a "Singles Meeting" and some fifty rigs huddled close in the camp' s special area. An animated breakfast was underway in the large recreation hall. For such a busy camp, the showers and restroom areas were well kept up and clean. Prices are listed at $22 to $41 with a "golf course view". Tel: 1 (800) 426-4678 & (619) 345-4770 Further from Palm Springs than their publicity leads us to believe, this is an RV resort for golf lovers. Not a championship golf course, but an executive 9-hole facility it caters mostly to large sophisticated rigs, displayed like so many show pieces on concrete slabs, well in view of each other. Definitely no tents here. 614 hookups paved and level, private security, a pro shop, club houses complete with billiard rooms and banquet areas, Mediterranean condos for rent, all contribute to an exclusive resort atmosphere. Elegant green and flowered landscaping features ponds and waterfalls, in sharp contrast to the surrounding desert. When we visited, an elderly group of people in casual, but elegant sportswear was quietly standing in line, awaiting a table for brunch. In the oak trees of the Temecula foothills, this camp is under the new ownership of Charles Knapp, has reopened a year ago and benefits from recent improvements: the clubhouse, office, store and bathhouse, all have been touched-up or remodeled. At the time we visited (may of '97), it was not crowded and we had a pleasant wilderness feeling. San Onofre State Beach includes over three miles of unspoiled, undeveloped California coastline. San Mateo is the newer of two campgrounds on this State Beach (the other one is San Onofre Bluffs, mostly for smaller campers and tents). Nearly 70 campsites have electrical and water hookups. Showers and restrooms were fairly clean when we visited in May of '97, and there is a dump station.The sound of nearby canons from a US Marine Camp adds to a feeling of adventure and the great outdoors. Coastal scrub plants, eucalyptus and dense foliage surround a 1 1/2 mile scenic trail that ends on a wide sandy beach known as "Trestles", one of the best surfing spot in the United States. Cottontail rabbits are guaranteed to enliven your walk, while coyotes and mountain lions most likely will keep hidden. We paid $16 with hookups and the dog. Our favorite site was #23 for privacy and access to the trail. Pleasant trails lead to El Capitan State Beaches. The Marina at Lake Piru Lake Piru, in Ventura County, in the Los Padres National orest , close to the Sespe Condor Sanctuary. Boating , trout and bass fishing , water skying are the main attractions. The camp itself, however is poorly maintained and designed to accomodate as many campers as posible, rather than make the most of its beautiful Olive grove. And expensive: $22 for full-hockups in a cramped, view-less area. In fact, contrary to the hostesses's affirmation there is no good view of the lake anywhere in the camp. Our favorite site was 172E. (Electric only). Plus $2 for the dog, because according the hostess, he stayed 2 days, while we only stayed overnight!!! On the Malibu Coast, about an hour from LA. A "primitive" Camp (in Point Mugu State Park), but only $15 in high season and you park right near the wide, sandy, clean beach. Picnic tables are provided. Romantic beach walks and gorgeous sunsets are free!